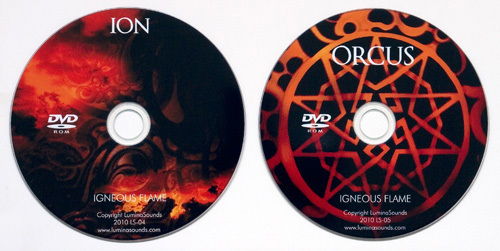 'ION' and 'Orcus' have been released concurrently (October 2010), as expressions of the polar opposites of Igneous Flames' work. Artwork by visionary artist Kati Astraeir (design by Pete Kelly). Sister release to 'Orcus', October 2010. 'ION' was created from synthesizer sound sources exclusively. 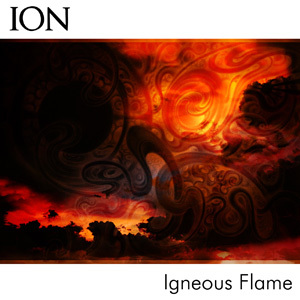 Unlike other Igneous Flame albums which are predominantly constructed from guitars / environmental recordings, 'ION' works with a different 'sound-palette'. A longform work (130 minutes), 'ION' is intended as music for relaxation / dreaming. Musical themes repeat throughout, seamlessly and subtley shifting tonal hue. Significant attention has been taken to ensure a sonorous and balanced sonic consistency throughout the work. Keywords: Subtle music / quiet music / private music / inner music / sky music / energy transformations. Thanks to Kati Astraeir for her evocative artwork, suggesting hidden / unseen / occluded energy vortices in a fantastic sky. Sister release to 'ION', October 2010. 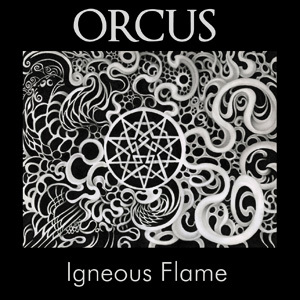 Raw, potent and at times unerringly chthonic, 'Orcus' is a relentless collage of outer-stellar dronage, refined industrial noise(s) and processed binaural recordings. It continues to explore the holophonics of Igneous Flames' earlier 'Intox' and 'Hydra' albums. Powerful sounds and energies have been fused together in this release, which is intended as a statement on the current corrosive energies unleashed into the world. Best listened to on headphones (loud !) - due to the use of binaural recordings and spatial processes employed. Both releases are exclusively available here as a DVD-ROM (data) disc. Each DVD-ROM disc contains the album's wav files, 320kbps mp3s, high-resolution artwork and a free track from the album sessions (unavailable elsewhere) - 'Starlit' (ION) and 'Tectonic mass' (Orcus). Taiyo Yuden DVDs, packed in quality moulded cases without booklet or printed artwork, except full-color printing on the disc itself. These discs are a limited edition 'archive' release for listeners who want a higher quality audio option / physical 'object'. These albums are longform (traditionaly double album duration) works - 95 minutes (Orcus) and 130 minutes (ION). This is one of the reasons that they haven't been released as CDs - so that they are 'single' album releases. ION DVD exclusive This DVD also contains seven extra, exclusive images by Kati Astraeir and three manipulations of Kati's work by Pete Kelly. Now sold out (November 2011). Also available on all the major download sites.